A cloud based tool for managing Sales, Marketing, Customer Service and Support, Quotes, Jobs, Inventory and more. Manage your business in real time from anywhere, at any time, with mobile access through secure internet access. Module based system allows you to build to suit your business. Manage & Track activity - Categorise your contacts - Bulk email to contact categories - Import or Export contacts. Track Leads & Opportunities - Track milestones for lead types - Lead Analytics - Capture web site Leads - Track referral sources. Create HTML templates - Bulk email contacts - Track email campaigns - Advanced email reporting - Marketing campaign management. Manage Multi-Locations & Suppliers simply as well as Items with multiple options and Kits. Manage multiple level price lists by customer and by bulk discounts. Simple stocktaking and alerting for low stock levels. Deliver superior customer service through direct online ordering out of inventory with full reporting and delivery management. Manage all your Purchase & Sales orders with the full Delegated Authorities and Approvals for all users. 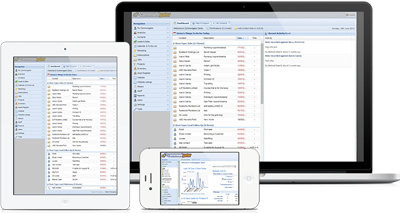 Manage any type of Job from desktop, tablet or mobile phone; as well as the staff who are doing them. Time management and GPS Locations from mobile phone. System covers Quotes, Automatic Job creation on Quote acceptance, Resource groups, Tasks, Time sheets, Costs, Materials right to Invoice. Automatically create a Job from a converted Lead, based on Quote acceptance, giving you an easy admin path for Job Management, as well as add Inventory & other costs to Jobs ensuring nothing is missed. Project Management - Asset Management. Priced individually to suit your requirements.